The Salento is made of hidden corners to discover that once seen will capture the traveler for the colors of the natural environment: the odorous green Mediterranean flora merged with the cobalt blue clear sea. And then you go to discover art and popular culture of this land unique, characterized by the smiles and hospitality. 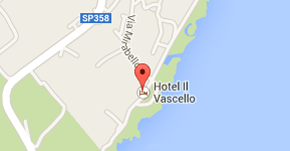 This is the small town that houses the Il Vascello Hotel. The framed by the rugged promontory of rocky coastline and cliffs overlooking the sea. The other is Tricase Porto marina resort with its 269 inhabitants is a fishing village. Tricase is one of the major centers of Salento and includes fractions 5 and 2 marinas. When it comes to dawn in Salento we can not think of Otranto, a town of 800 martyrs. Gallipoli is the queen of the Ionian coast, with its tourism, grown a lot in the last period. Is the undisputed capital of Baroque, rich in monuments, churches, palaces with a veritable explosion of art and culture.